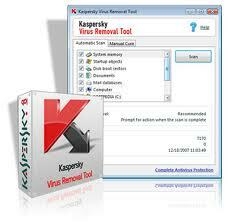 With The Kapersky Virus Removal Tool Do you can removing Viruses , Spyware and Disinfect infected Computer from other malware. · Simple in installation and uninstallation Application . · A full-functional use of the application from a flash card. · Compatibility with real-time protection anti-virus applications. · Active use of the "cloud" technology of Kaspersky Security Network.